Several years ago, a friend of mine told me about this county park south of Marathon. 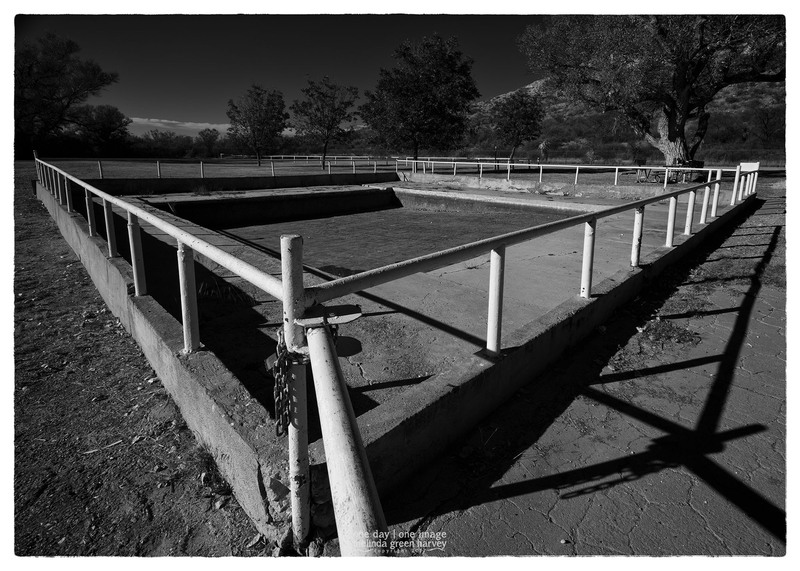 It’s on my regular rotation of places to visit when I make my Far West Texas trips, and I’ve become fascinated (or, obsessed – it’s a fine line) by this wading pool. Last year it had water in it, and I didn’t have a wide enough lens to get the shot I wanted. This year, I had a wide lens, but there wasn’t water. Posted on November 16, 2017, in Photography and tagged 365 photo project, black and white photography, desert, learning to see, Leica, marathon, marathon texas, melinda green harvey, monochrome, one day one image, photo a day, photography, postaday, texas, thoughtful seeing, travel, travel photography, wading pool. Bookmark the permalink. 11 Comments. Much better without the water, I think. Unless the water is just a puddle of scum, in which case I stand to be corrected. That aerial view looks a little bit green. I have no idea what the green is, though. Excellent to have an excuse for another trip with Marathon, wide angle in hand, just in case there is water (with scum). Maybe it will take several visits before everything aligns. That would be a pity, but I bet you are up to it. I am VERY committed to this, as you correctly surmised. So, yes, I will make as many trips as needed. Also (in response to your question over on Instagram), I can verify the color of that trailer!